There's no real history lesson or one of my "stories" in this week's posting. Well, okay, there is a little...but mostly I've put together a collection of pictures that were taken on one of my most favorite holidays, Independence Day, showing how a few of us living historians celebrated the glorious 4th this year. 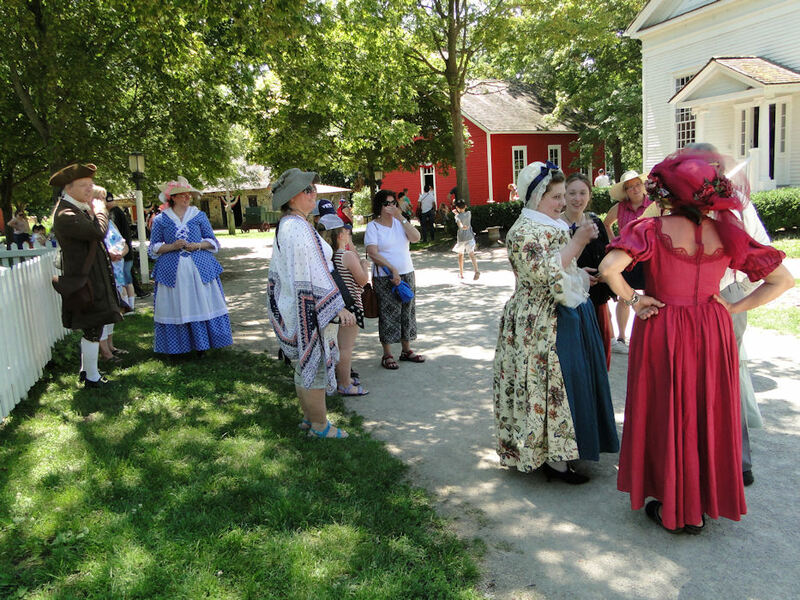 Every year since 2010 I have spent my 4th of July's at historic Greenfield Village while wearing period clothing. 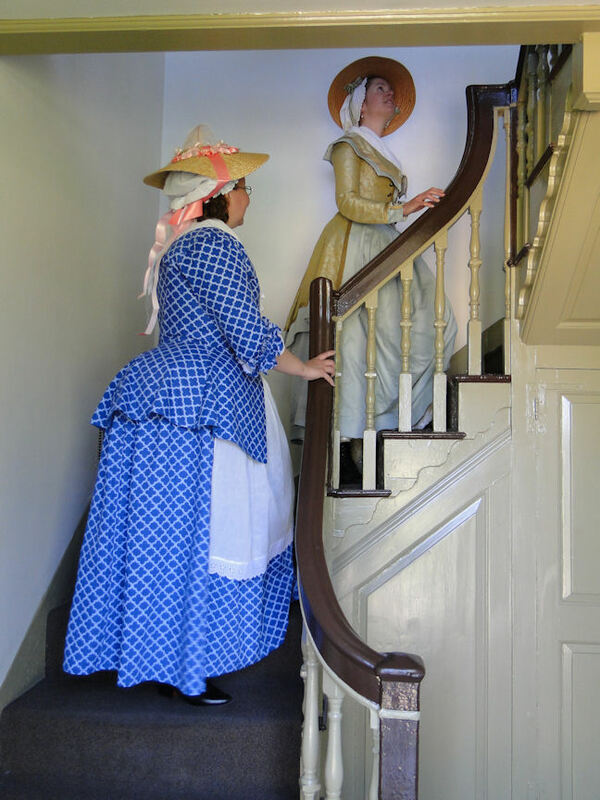 For the first few years I wore my 1860s attire, but, since 2014, I changed over to the fashions of the 1770s. And I never fail to have at least one other reenactor come along with me - many times a half dozen or more will join in the celebratory fun. And we spend the entire day there, waving back at visitors who wave at us, taking pictures with others, speaking with the presenters inside the historic houses (which is my favorite part), and usually end up eating at the Eagle Tavern. Well, this year our celebration was changed up a bit. Just a bit. And we'll get to that shortly. But first I just want to mention that it really was nice to have members of my reenacting group, Citizens of the American Colonies, join me once again this year. 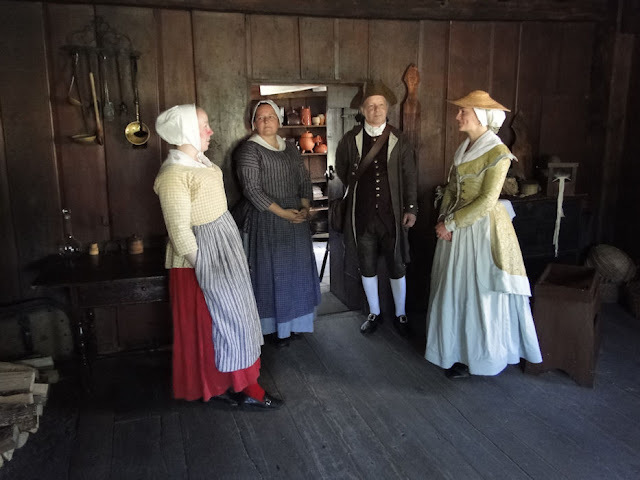 Citizens, as you may recall, is a new living history group I formed, and I am happy to say it is still growing, so you can imagine how very glad I was to have a few members come out. So! On the morning of the 4th we met bright and early at Greenfield Village. The bright sunshine was in its summer glory - the sun always seems to shine on the 4th of July - and we knew the day was going to be something special. Whenever I am at the Village and dressed in the styles of our founding generation, I always make it a point to head first thing toward the far end where the original colonial houses sit. And this year was no different. As always, we had a wonderful time speaking with the presenters who were working inside the 1750s home of Samuel and Anna Daggett, and we also enjoyed the opportunity to take a few "quick sketches" while there. 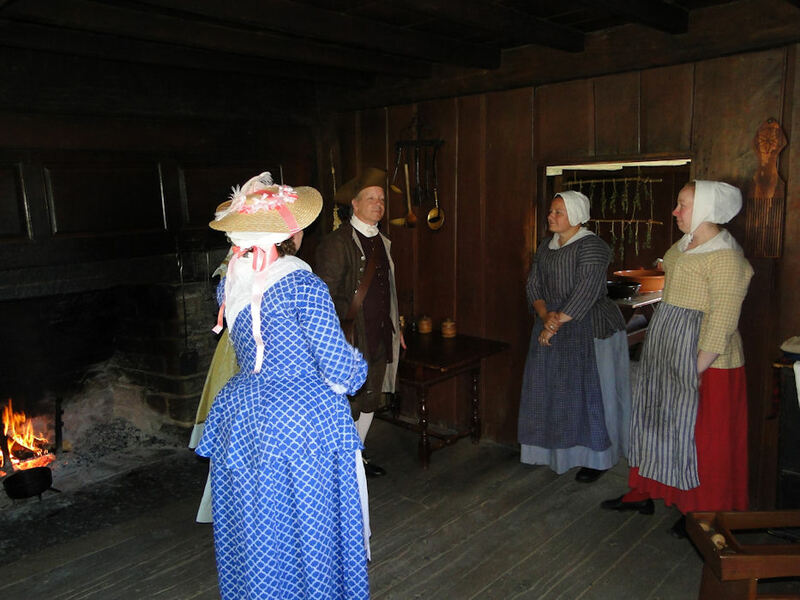 ...and the way the Village utilizes a sort of "2nd person" presentation (combination 1st & 3rd) makes the house come alive in ways few historical houses do. Yes, the spirits of the past are rife within its walls, and are even more present when one is in fitting clothing of the time period. And they do make it come alive - the knowledge of the more senior presenters who work at Greenfield Village is, at times, astounding. 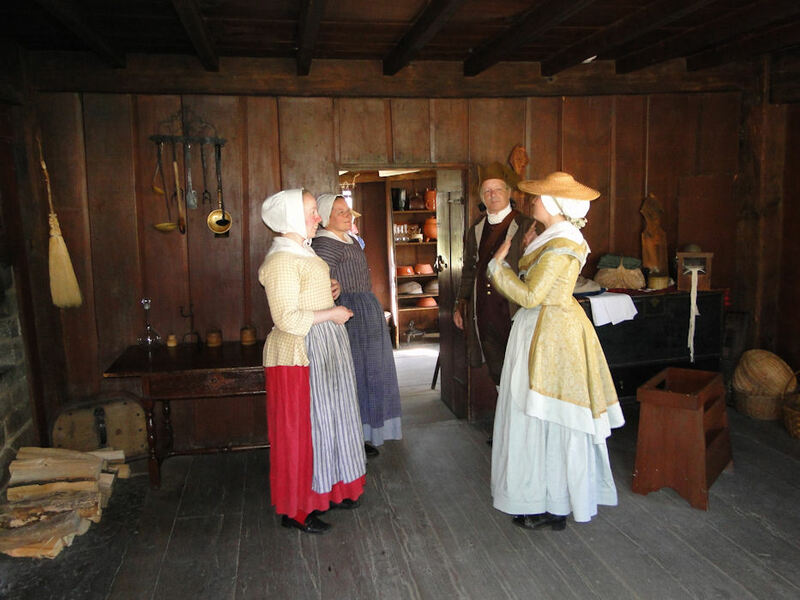 This is because for years they've done a variety of historical skills and chores first hand, including cooking, cleaning, mending, spinning, dyeing, sewing, controlling the heat of the cooking hearth, rendering lard, farming, tending the garden, and repairing tools (just to name a few). 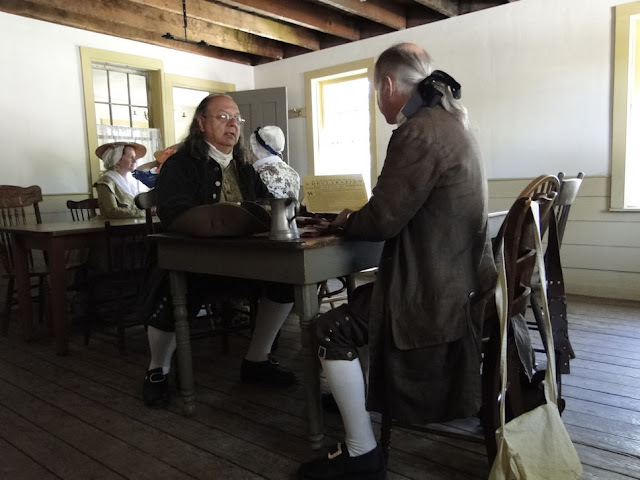 Yes, the period-dressed presenters here gain a wealth of knowledge and experience over the years that goes beyond your typical book-smart historian. And the way these experts work with the newer presenters reminds me of a mother or father passing on their skills to the kids...for future generations. Learning by doing - just like in the old days. 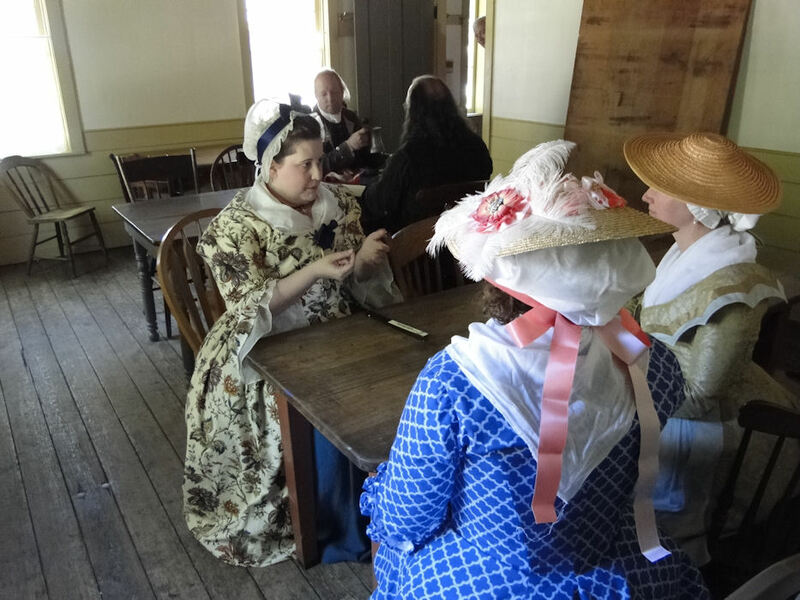 Many living historians/reenactors also learn the skills of old and, when the opportunity arises while at a reenactment, will apply them to presentations as well. Here we see a few members of Citizens of the American Colonies living history group intermingling with Greenfield Village/Daggett House presenters for a visit (actually, one of the presenters - Larissa - is also a member of my "Citizens" group). In case you are wondering, the ladies are all admiring my new brown cocked hat I had made by Abbie Samson at Samson Historical Colonial Outfitters. Okay, so they're not. But it's still a very cool hat, don't you think? every other house in the surrounding area. along with a host of other things (besides tending his own farm). The home life and daily activities of Anna and the children were closely connected to the work that Samuel did. On farms in the colonial era, each family member played an important role in producing food, clothing and household goods for the family. The breached boy would be out with father on the farm while the daughter would be learning to run a household like her mother, among their other daily duties. Girls and boys would both care for the animals, including gathering eggs, grooming, and feeding. The household ran like a well-oiled machine: everyone had their part and place, and one missing link could throw a wrench into the entire operation. Each role was just as important as the next. Ahhh...nothing like a colonial photo. Except, there were no photographs in colonial times. you see above. Because so many of the paintings of the period depict mostly the well-to-do wearing the latest fashions made from the fanciest silks and other fibrous substances, that's what we think of when we imagine the people of these times. upper-class paintings we're used to seeing. And to see colonials smiling or even laughing seems to be way beyond our comprehension. I mean, people were miserable back then, don't you know! They hated their lives and dreamed of a future where automatic washers & dryers and motorized tractors would make life easier. Yeah...there are those folks who tend to think that way...as if there was no happiness at all in the 18th century. As we strolled along the street to visit a few of the other historical homes, we enjoyed the waves and smiles from guests as they rode past us in Model Ts or saw us in the distance from the trains. 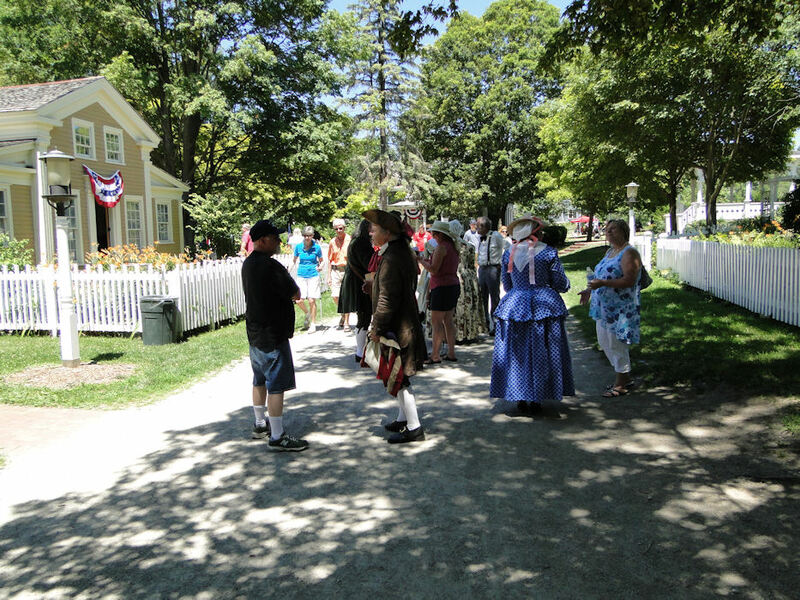 I believe they really enjoy seeing "colonial" folk walking around on Independence Day at the Village - it adds to the magic of history. In fact, I must admit a bit of disappointment that the powers-that-be haven't seized the opportunity to open up the Giddings House on the 4th of July to show, like they used to, a comparison between the rural Daggett Farm to the more upscale Giddings. That would be a very welcome Independence Day bonus! 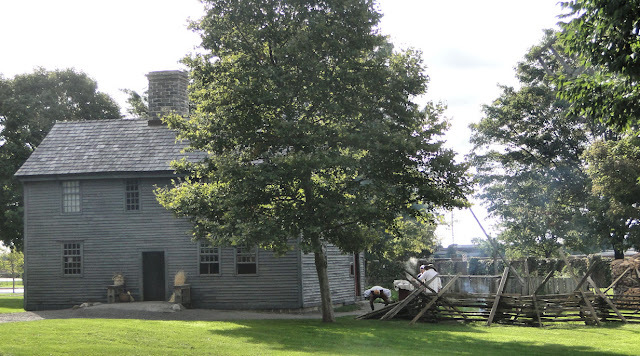 Now let's head toward a real Revolutionary War house, the former home of John and Mehetable Giddings, formerly located in Exeter, New Hampshire. Mr. Giddings, one of the most active and trusted supporters of the patriotic cause in the Legislature, commanded a company of those who marched from Exeter, New Hampshire to Portsmouth to support, if necessary, the party of General Sullivan and Laughdon in the raid upon Fort William and Mary in Portsmouth Harbor in December 1774. In 1775, he was nominated for the important appointment of delegate to the Continental Congress, but modestly withdrew his name. Susan and Rae, the two lovely ladies who accompanied me, are both clothing historians and expert seamstresses. Either one could have lived in the Giddings House. two on the second floor and two on the first. interesting feel to it, so out came the stealth camera. And that's all she wrote for the Giddings House. Until they decide to open it up to the public more often, visitors can only see its colonial beauty through plexi-glass. I believe they certainly are missing a great opportunity here. 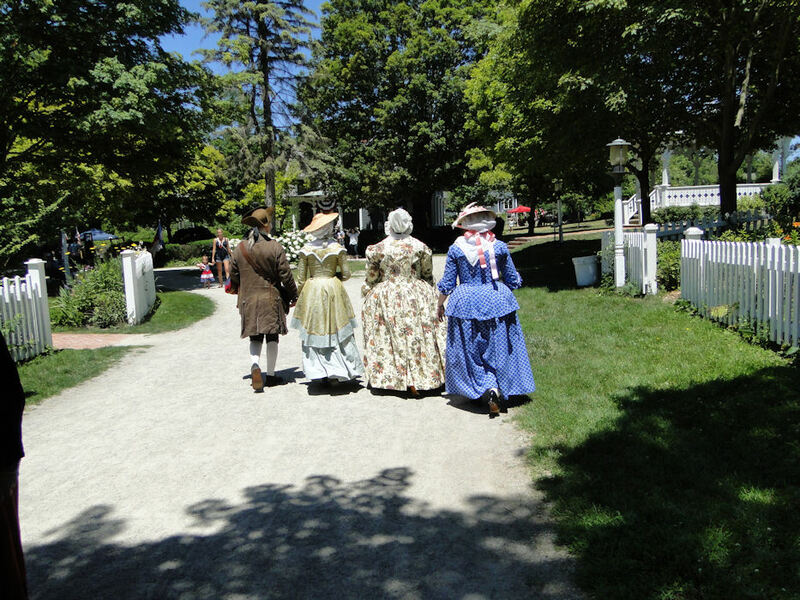 Rae, Susan, and I spent the perfect morning at Greenfield Village, but, as mentioned earlier, we decided to change it up a bit for the afternoon. 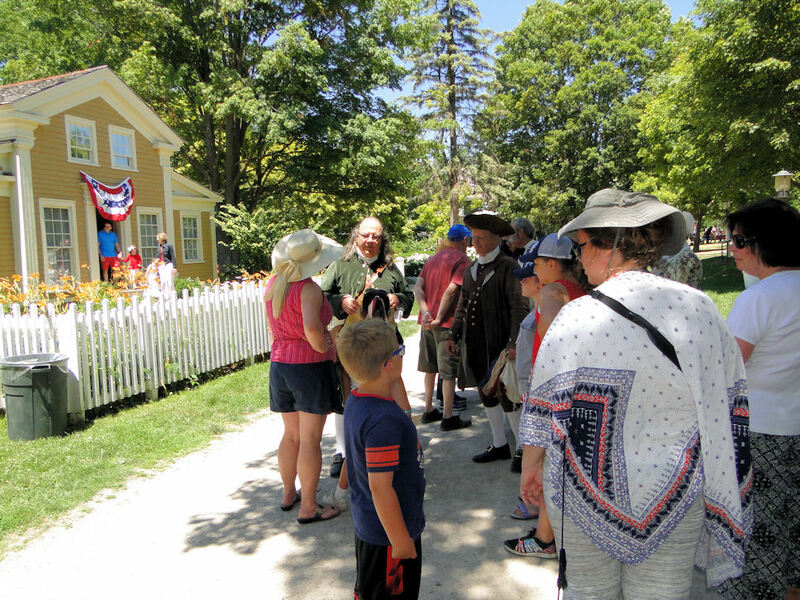 As the noontime hour came around, we left Greenfield and went to a smaller local open-air museum called Historic Mill Race Village where Independence Day celebrations were also going on. My friend (and Citizens of the American Colonies member) Lauren had been asking/needling/cajoling me to give Mill Race a try for the 4th of July for the past few years, and this year she told me she would jump up and down with joy if we came. And she held to her promise! The 200th anniversary (bicentennial) of the United States declaring Independence from England certainly speared quite a national pride in America's history, and not just on the east coast. Beginning in the late 1960s and continuing on throughout the following couple of decades, historic preservation seemed to become a national past time. Nearly every village, town, and city began to preserve their historic structures which then became a source of pride for the citizens. but the small-town atmosphere is omnipresent, as you can see in this photograph. Small-town America. Ya gotta love it! 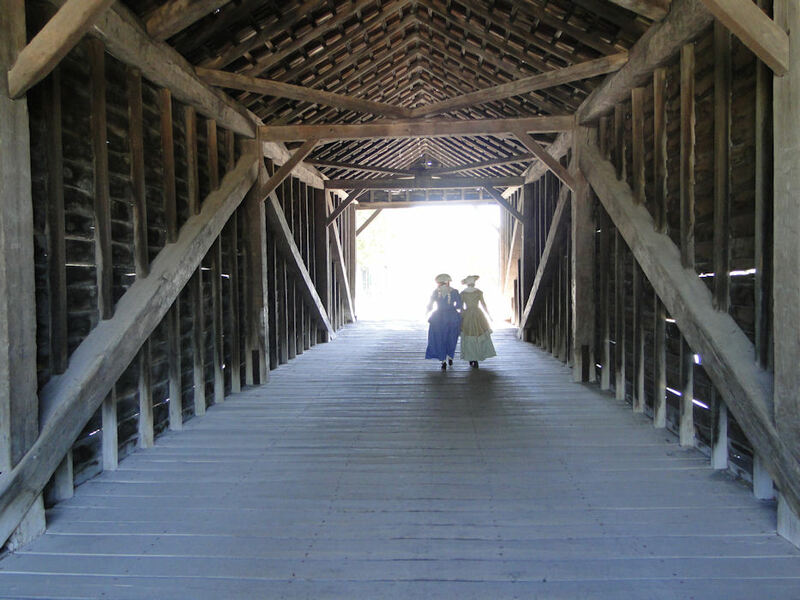 Mill Race, created back in 1972 by the Northville Historical Society, was one of those sources of pride. It was built upon land donated to the City of Northville by the Ford Motor Company, which was originally the site of the city's first gristmill (hence the name Mill Race). 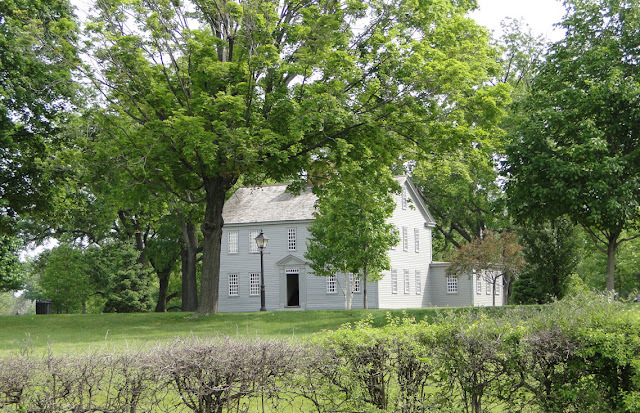 It is now home to 11 historic structures, all from the general surrounding area of Northville. I wasn't sure what to expect upon arriving there. Yes, I have been to Mill Race before and even wrote a blog post about it (click HERE), but I have not visited for the 4th of July. I'm certainly glad I did, for they depicted an old-fashioned Independence Day celebration that included other reenactors as well; they had the Ottawa Longrifles and Civil War Sharpshooters, which were very cool, but, unfortunately, no Continentals or Redcoats, which was a bit disappointing. 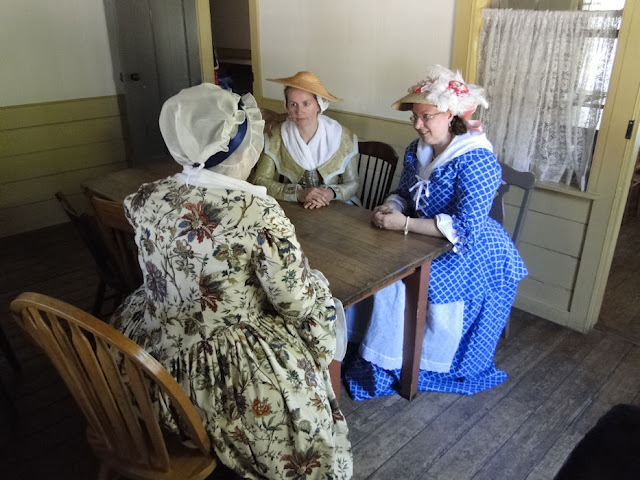 No matter - we were a welcome addition to the other historical reenactors, and each, representing a sort of timeline, tended to compliment each other. 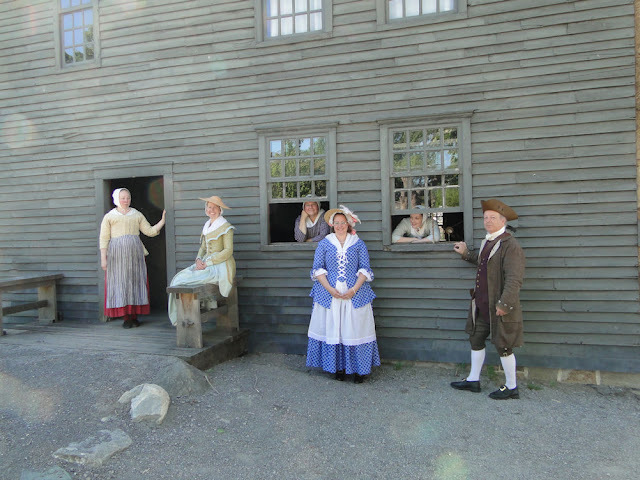 Members of Citizens of the American Colonies posing in front of the Cady Inn. Our first stop, to help get us back into the 18th century mindset, was the the local ordinary (tavern). The Cady Inn was built around 1835 in Northville and was moved to Mill Race in 1987. Though it is not an actual Revolutionary War tavern, it is very reminiscent of those from the Revolutionary period, especially inside (though the exterior can pass from the period as well). We found it to be a pleasantly historical experience as we sat at the tables in one of the rooms. 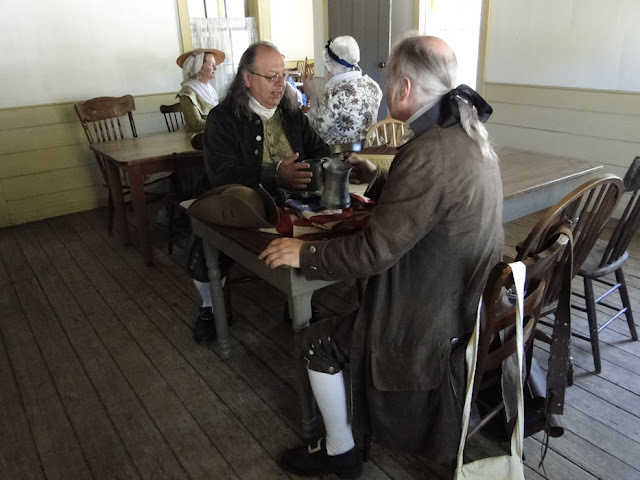 The atmosphere, as we shared and discussed news and information from the 1770s and 80s, had an almost immersion feel. am travelling to Philadelphia, shall have to return at such a time, and have no news. Now, what can you give me for dinner?'" Dr. Franklin laughed at the story and told me that, yes, it was quite true! (Flip, by the way, was a blend of beer, rum, molasses (or dried pumpkin), and eggs or cream, and was usually mixed in a pitcher and then whipped into a froth by plunging a hot fire poker (called a flip-dog) into its midst). 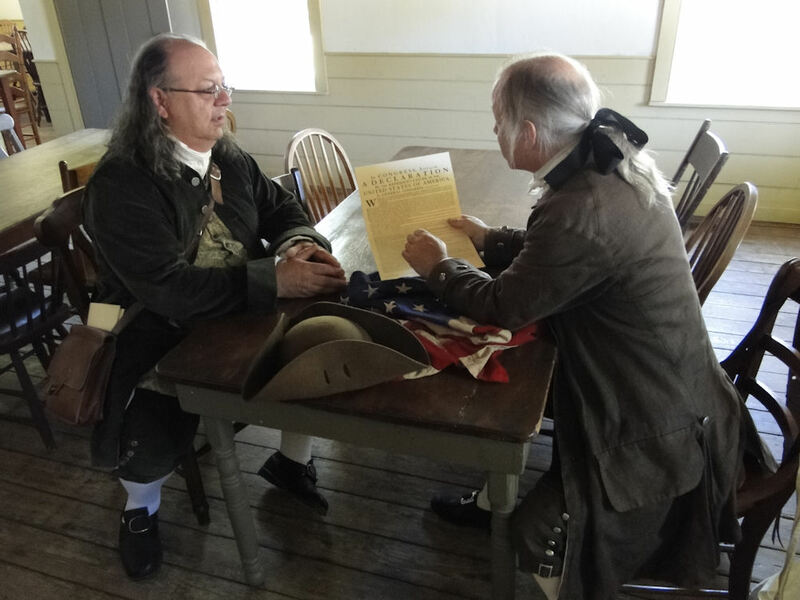 Dr. Franklin and I discussed the first printing of the Declaration of Independence, known as the John Dunlap broadside. It would have been a rare sight to see a lone woman inside of a tavern unless she was the tavern keep's wife, daughter, or a server. would not have been uncommon. current events and politics, are sitting at a different table away from the women. been in a separate room altogether. Now, there are two main types of reenacting that I enjoy: "being there" and "presenter." 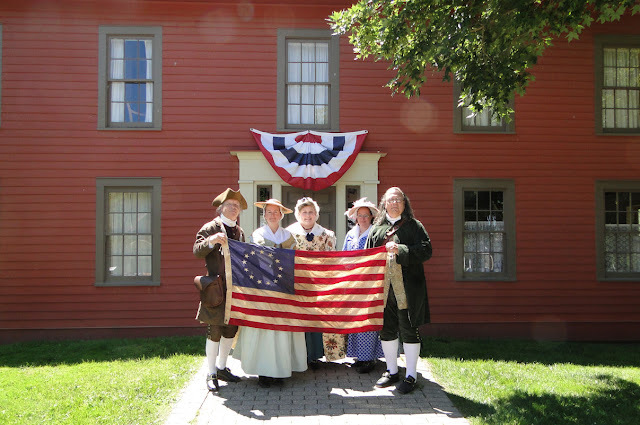 Since we have had no real 'formal' reenactments to attend on the 4th of July, we tend to sort of make our own (though Mill Race may be a new beginning for us). As you have seen in several of the pictures above, we can do somewhat a bit of immersion...to an extent. 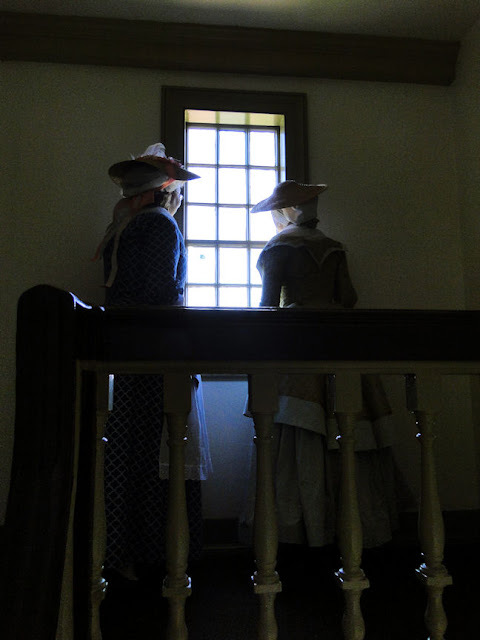 There are modern folk around, but it can be easy to block them out and get in the moment, as the ladies, Dr. Franklin, and I did by "separating" ourselves from most of the public for a bit while in the inn. And by doing this "being there" practice before attending to the public, it helps to make it real enough for us to face them with the right mindset, which brings me to the other type of reenacting I enjoy: presenting. 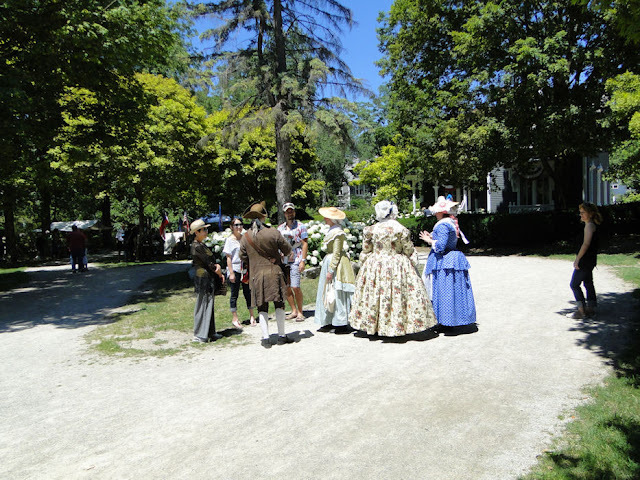 It was a great time to "mill" about Mill Race and speak to the visitors there about Independence Day. And that's something we all very much enjoy doing. I mean, it's our passion: it's American History! 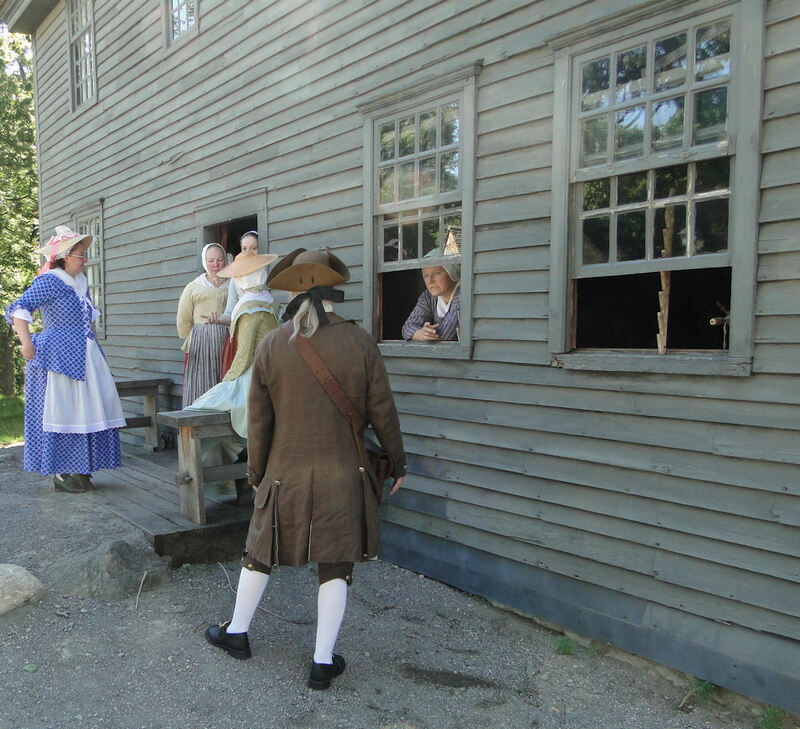 I spoke to people not only as Paul Revere, but also as regular old Joe-colonial citizen. Of course, it helps to be recognized as the person you are pertaining to be, in the way Bob Stark eerily has the features of Benjamin Franklin, which was immediately noticed by adults and children alike. But all of us had our opportunities to speak on a variety of historical subjects with the public, who seemed thrilled to have us there. They asked us questions about our clothing, about who we "were," and about the times in which we lived. In fact, many thanked us for taking the time to be there. This is what Independence Day should be about! is to bring a small accessory or two; it seems to complete the scene for visitors. On this Independence Day I brought my "Betsy Ross" flag along. The cool thing about this flag is it's not made of nylon, which is typical for most flags made these days. Instead, it is made of cotton, and this really impresses the people. But I explained a bit about the history of this flag and discussion ensued on the controversy on whether or not the Widow Ross actually made the original. There's no proof either way. In case you hadn't noticed, I enjoy "behind" pictures. Why? Probably because there are so few taken in this manner, and it gives a different, um, perspective on the subjects. As we strolled up and down the lane we were greeted by quite a few modern visitors. I was pleasantly surprised to meet a number of folks who were new to our country: I met some from Asia and, for my first time ever, I met a family from the Congo! All seemed to be very excited about America's 241st birthday celebration and were enjoying sharing in our national pride. 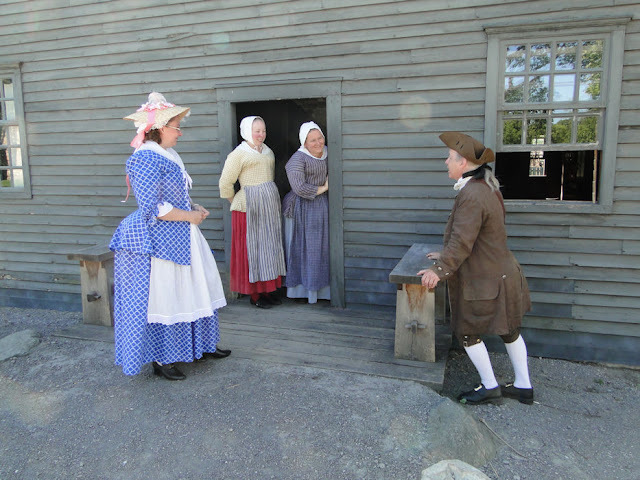 Citizens of the American Colonies participants before departing. This was one very special Independence Day celebration, and I think all who participated will agree with me. There was a strong sense of American pride spread throughout, and that was a real pleasure to see and feel. Yes, national pride is still strong in the general populace, thank God. 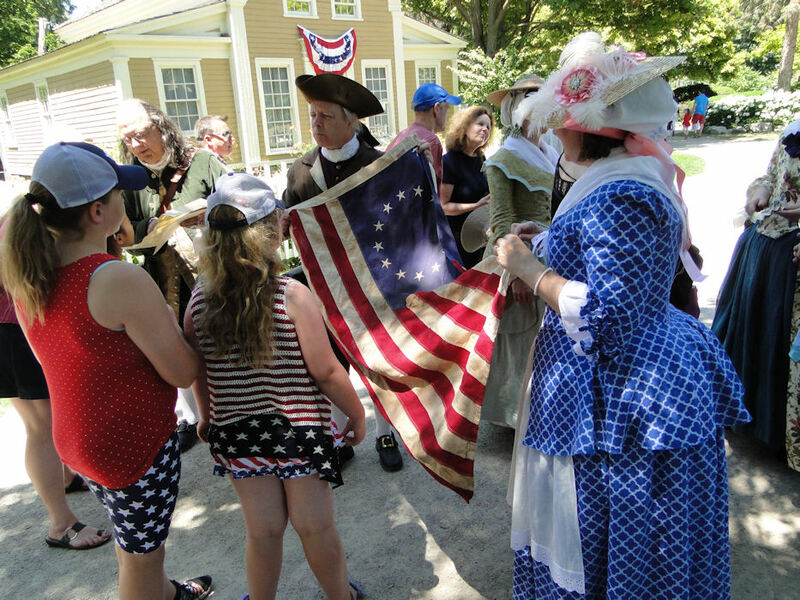 The time we had visiting both Greenfield Village and Mill Race Village made our Independence Day everything we could ever hope it to be, and I thank everyone and anyone who played a role in it. 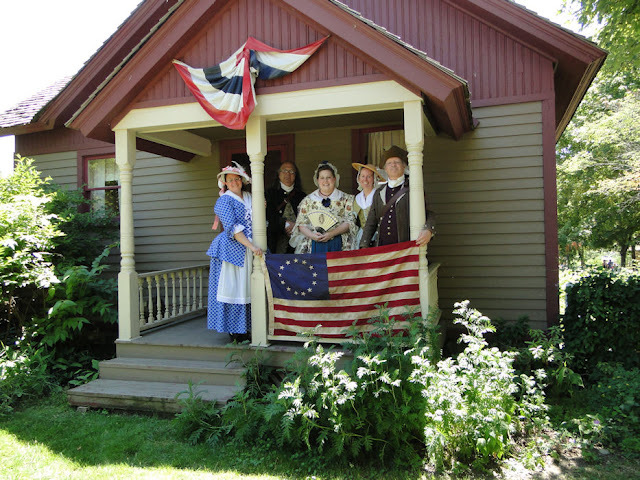 "On behalf of the Northville Historical Society, We would like to extend our thank yous to all the wonderful, terrific and very special people who volunteered their time to make Fourth of July a celebration of the history of this great country. 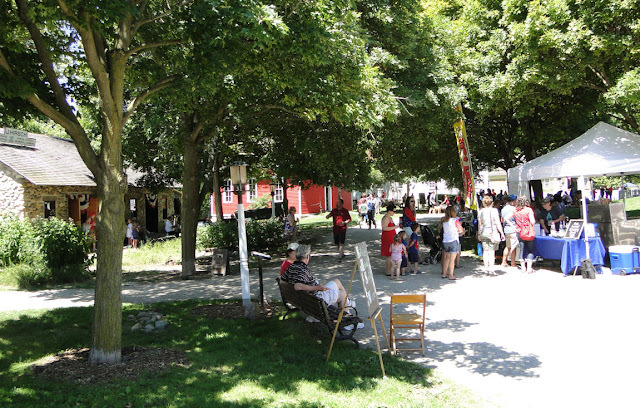 Thank you very much Ottawa Longrifles for handling the kids games and life in the 1800's exhibit. Thank you Jim Bone and the Civil War Sharpshooters for your demonstrations of Civil War soldier's life. Awesome cannons! Thank you to the Citizens of The American Colonies for bringing Ben Franklin and friends to remind us of where and how this country began." Yes, I am very proud indeed! I have to give a very special "thank you" to Dave Tennies and Jeff Hansen for being the chief photographers at Greenfield (Dave) and Mill Race (Jeff) Villages. You both did an awesome job!